But WHAT do you eat for lunch? I hear this all the time from people (right after they ask me what I eat for breakfast). Those who’ve never contemplated life without wheat sometimes have a hard time thinking about lunchtime without a sandwich. But really, once I was out of elementary school, I gravitated to non-sandwich foods whenever possible. And when I was younger (in my pre-celiac days) and starting out my career in New York City, lunchtime was one huge, inexpensive smorgasbord. Except for the occasional New York deli indulgence, or when I wasn’t being wined and dined on a corporate expense account, (ahhh, the good old days), I loved the fact that I could eat on the cheap so easily in the city. Cheap and delicious (and sometimes it was even gluten-free): delicate, fresh sushi rolls from the corner sushi place, Korean grocery store salad bars with their infinite variety, tiny soup places where you could get a hot cup of wild mushroom or three bean soup for a couple of bucks, and I could always buy one slice of incredible, blistering hot pizza for even less. It was all so easy, and for a few dollars I could feed myself enough to get through the afternoon and then, get back to work. Years later, I still try to feed myself economically, in terms of time and money, during the workweek. Soups and bean salads are high on my short list of go-to favorites (and they travel easily for those who want to bring their own lunch to work or school). Even though there are so many different kinds, I find that I often come back to the same dozen or so recipes over and over. And the best part is that they are all naturally gluten-free. 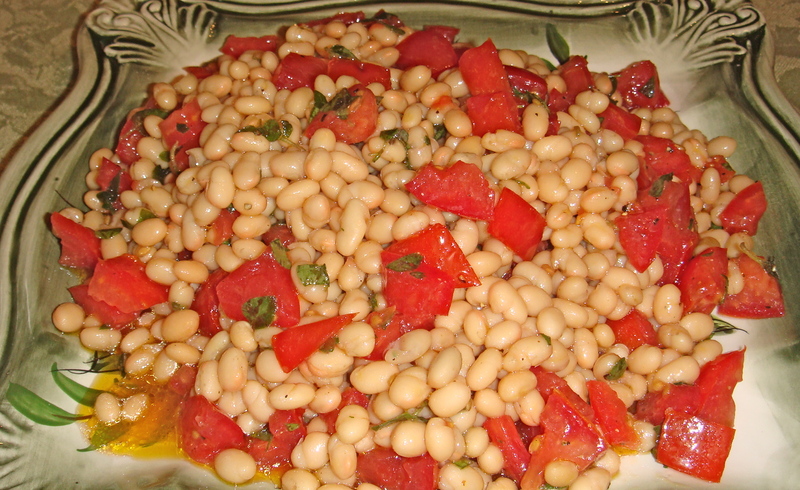 During the summer, with fragrant, fresh oregano growing on my patio and incredible Jersey tomatoes everywhere, I made this white bean and tomato salad several times a week. Why so often? Because it seemed to disappear almost as soon as I had made it; my son Alex was home from college and he had taken a strong liking to it. Sous chef boy (my younger son) won’t touch a bean unless you wrestle him to the ground first (which is impossible for me to do because he’s so big), but his older brother more than makes up for this lack of enthusiasm. Alex, however, doesn’t like onions much so I chopped up scallions instead, and sometimes I didn’t put them in at all because the tomatoes really were SO incredible (see the salad in the picture below). It is proof that you can do a lot with very little if the ingredients are of good quality. 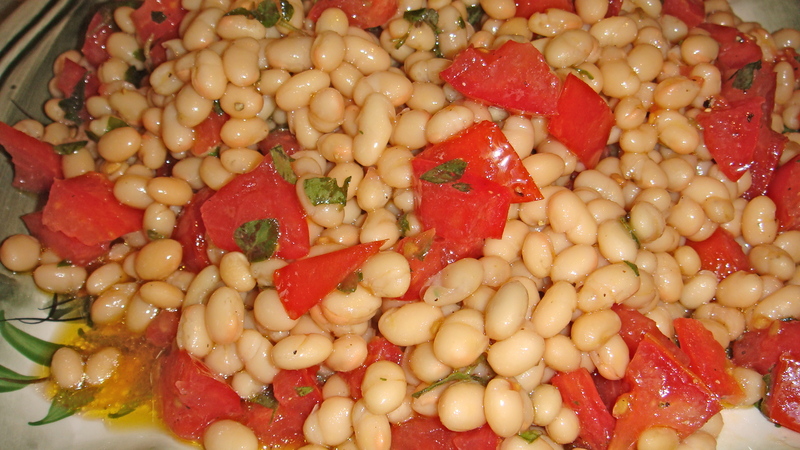 Now that tomato season is almost over, I’m still making my White Bean Salad as much as I can. I know that in a few weeks I’m going to have to switch over to using good, but not incredible, grape or cherry tomatoes. But not yet. You can enjoy this delicious bean salad year round because when good quality, seasonal tomatoes are not available, cherry or grape tomatoes makes an excellent substitute. For variation I like to add crumbled feta or goat cheese, and sometimes, fresh corn off the cob. I also like to substitute basil for the oregano every now and then. 1. Rinse beans with water and drain well. Blot with a paper towel to remove as much moisture as possible. Place beans in a medium bowl and add onion and tomato. Toss with olive oil and oregano. Season with salt and pepper to taste. Serve at room temperature. (Can be made up to one day ahead. Cover tightly and refrigerate. Allow to come to room temperature before serving). Looks great! Beans are huge in vegetarian diets, so I’ll be trying this soon, before all the beautiful tomatoes are gone.